This is open. Passenger services are provided by ScotRail between Kyle of Lochalsh, Stromeferry and Inverness. This line runs through an area of low population. The only population is at Dingwall, its eastern end. At the original western terminus (Stromeferry) and later terminus (Kyle of Lochalsh) ferry services operate(d) to Skye and the Outer Hebrides. At this junction the line leaves the former Inverness and Ross-shire Railway line to Thurso and Wick. The junction faces Inverness, to the south. In the photograph a sprinter is shown which is heading towards Kyle of Lochalsh. This was the junction for the Strathpeffer Branch. The branch opened in 1885 and closed completely in 1951. The junction faced East, with the signal box on the down side of the track. The box closed in 1936 was reopened on 23 June 1940 and closed again on 20 August 1944. The photograph looks towards the junction from an occupation crossings. The station is closed. This is one of the original stations on this line. The station was originally built for Strathpeffer but was replaced when the Strathpeffer Branch was opened; the station being renamed Auchterneed from Strathpeffer in 1885. This station and signalbox were closed in 1966. There was a loop at this station, the box and loop closed 24 March 1966, the station closed to passengers 7 December 1964 and goods 18 May 1964.. This siding was located close to Raven's Rock Summit, one of the highest summits of the line. Raven's Rock Quarry siding was opened about 1923. The siding faced west, the siding's Annet's key being acquired from the signalman at Auchterneed. There were five sidings in total, two under rock crushers. The Quarry closed in 1939 and the track was removed in 1952. Commonly the Pilot from Dingwall would use the key as a token, this ceased in 1966, when Auchterneed box and station closed. This is one of the original stations on this line. The station building is similar to those at Achnasheen and Strathcarron which date from the opening. The passing loop is designed to allow space for train-mounted fishing boats to pass each other. The photograph looks towards Kyle of Lochalsh and shows the early morning "meet" of two sprinters. The sidings at Garve have been much reduced. The East and West boxes were closed 1 April 1984. This station was opened to the public in 1872 having been previously a private platform for Lady Ashburnton on the Lochluichart Lodge estate. The station was closed in 1954 when it was replaced by Lochluichart (New). This was in connection with the Conon Valley Hydro Electric Scheme which raised the height of Loch Luichart. The station's remains are now under water. There was no loop. This station was opened in 1954 to replace Lochluichart (Old). The original station was submerged in Loch Luichart after its level was raised in connection with the Conon Valley Hydro Electric Scheme. There was no loop. The station closed to goods 27 January 1964. This is one of the original stations on this line. The station has reverted to its original single platform with small shed state. A passing loop was installed here at some stage and the down platform (on the right in the photograph) is now out of use and overgrown (the East and West boxes were closed 23 March 1966). The goods yard closed on 2 November 1964. This is one of the original stations on this line. The station included a Hotel and refreshment rooms opened in connection with the coach to Loch Maree and Gairloch. Originally the Hotel simply conisted of refreshment rooms. The Hotel burnt down in early 1996 and has been demolished. Now one must resort to the coaching Inn which lost much business when the Station Hotel opened. The station building (just visible in the left and centre photographs and clearly visible in the right hand photograph) is similar to those at Garve and Strathcarron which date from the opening. The passing loop is designed to allow space for train-mounted fishing boats to pass each other. A postbus service operates from here to Kinlochewe, Gairloch, Poolewe, Aultbae and Laide. Loan crossing and Luib crossing are one and the same. There was originally a siding here which was used to store split trains which were too heavy to take up to the summit in a single part while the engine would go back to the rest of the train and re-assemble it here. Luib crossing opened in 1914. Loan crossing and sidings opened for the Admiralty in 1919 (or 1 February 1918) (the addition of the loop on the site of the former siding and addition of a siding). Loan sidings were purchased from the Admiralty in 1920ish. The crossing and sidings have are removed now. The loop closed in 1920 and was lifted by 1922. This halt opened in 1872 and closed in 1964. The photograph shows an overview of the line near Glencarron Lodge looking West. The Station was built for Shaw of Glencarron and consisted of a single platform. Signals to stop the trains were operated by the passengers. There was no loop. 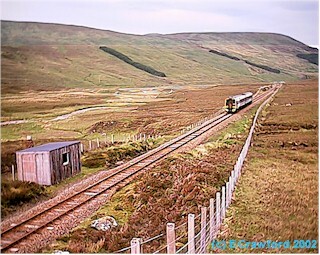 This station was initially a private halt for Tennant of Achnashellach. Tennant was a defaulting shareholder who never paid for all his shares and arranged for two private trains to Achnashellach for which he did not pay. The station was only staffed in Summer at first and not acquire buildings until some time after opening. A passing loop was installed here on 1 June 1900 and the up platform (on the right in the photograph) is now out of use and overgrown (box and loop closed 22 March 1966). The photograph looks West. Goods facilities (closed 27 Januray 1964) were located at the far end of the station. This is one of the original stations on this line. The station building is similar to those at Achnasheen and Garve which date from the opening. The passing loop is designed to allow space for train-mounted fishing boats to pass each other. The East box closed 17 June 1984 and the West became a gate box from the same date until the conversion of the crossing to automatic barriers. There is a short Permanent way siding can be seen. Attadale opened in 1873. It was mostly used by Attadale estate owned by Alexander Mathieson MP (and Chairman of the Dingwall and Skye Railway). An east facing siding was opened in 1878 and closed in 1966. The photograph shows Attadale looking east. The water to the left is the sea. Once it became clear the line could not be built through to Kyle of Lochalsh on limited funds Attadale was planned as the western terminus for the line with a pier, station and hotel. The site was considered unsuitable for a harbour and the line was continued to Stromeferry. In late 2001 a mud-slide onto the line just to the wast of Stromeferry forced temporary closure whilst a diversion was built, slightly further north, from the site. The muddy embankment above the site, weakenend by forestry activities, was stabilised and protective fences for catching boulders erected above the lines. This was the original terminus of this line. The original station consisted of a single platform within a wooden train-shed. Two tracks swept out onto the nearby pier which was fitted with a crane. The station burnt down in 1891. The station was the terminus before the line was continued to Kyle of Lochalsh by the Highland Railway in 1897. Ferry services were run from here to Plockton, Broadford, Raasay, Gairloch, Aultbea, Poolewe, Stornaway, Lochmaddy, Tarbert, Lochinver, Ullapool, Kyleakin, Balmacar, Glencloy, Isleornsay and Armadale. Initially the ferries were run by the Dingwall and Skye Railway, then the Highland Railway and finally David Macbrayne. 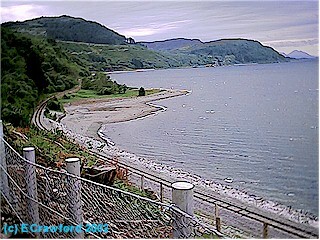 This pier never proved convenient and the railway company had to buoy and light Loch Carron. The original pier was demolished in 1937. A loop was installed at this station when the line was continued to Kyle of Lochalsh, but this has been subsequently removed, the down platform now being out of use. The East and West boxes and loop closed 20 March 1966. Frieght was withdrawn in 1964. It had been planned to close the entire line in 1973. However during a year's repreive it was decided to retain line and in connection with Oil Platform construction. In 1975ish the Howard Doris' Loch Kishorn Oil Platform Construction Site depot opened at Strome Ferry. This ceased to be used in 1982 when the sidings were isolated from the main line. The platform contruction site at Loch Kishorn closed shortly afterwards, road transport being used latterly. The track was lifted about 1988. A small amount of track remains within the fenced compound. (This compound is visible on the left hand photograph). Recently the Hotel at Stromeferry burnt down.